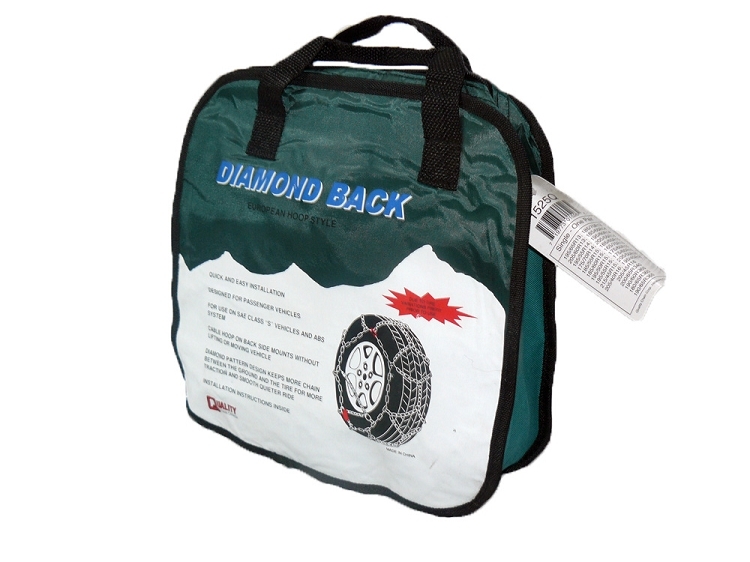 The Diamond Back is a premium European design tire chain. Square link construction with a diamond pattern for excellent traction, smooth ride and long wear. Please select your tire size for proper fit and pricing information. We had some difficulty as the chains they sent did not fit. Without going into a lot of detail, Cheryl, customer service, was extremely helpful, as the chains had to be returned. I was given an account number which the local LOOMIS people accepted without any problems. All I had to do was get them to the warehouse here in Courtenay. Within a 'couple of days, another set arrived and they DID fit. For what it's worth, the chains were for a 2013 Hyundai Genesis R-spec 5.0.. the tire specs are: 235/45 R19. If I had anything "bad" to say, it would be the fact that the chains were wrong in the first place, that probably due to the fact that THEY get their chains from Oregon, so they, presumably, rely on the US store to get it right. All the Ladner site does is send them on without checking that they are the correct size. This is in NO WAY a deal breaker! The way I was treated was first class, and I consider this "event" a "one off" and would recommend this site to anyone without reservation! Had to use my tire chains the week I recieved them. Very easy to use and they work pretty well. For sure they worth the price I've paid for them! I bought these exact chains 5 years ago. I live in a remote area where it snows heavily with icy conditions. I put these chains on in November and leave them on my car until April every winter. I finally broke one chain because my tire was low on one side and I didn't check the air pressure. As I was exiting my driveway in a foot of snow, I ended up spinning out and breaking the chain. Completely my own fault. After 5 years of use I could justify buying a new set. My bungees were also busted from - 40 temperatures. The new ones I bought recently are a better quality than the last ones and I think they'll be a bit more durable for the long run. These chains are easy to put on, I can slip them on in less than 5 minutes. Absolutely recommend these chains! I have yet to use my chains in an actual winter conditions but live at the base of the Coquihalla Hwy. so will have my chance. I did check the fit and are great to put on and fit perfectly. I ordered my chains in the afternoon online and they were delivered the next morning. Great service arriving 2 days after ordering. Would have been 5 stars but my 235/65-17 tires almost too large . Had to add enclosed extra link and unable to instal exactly as shown since not enough chain. 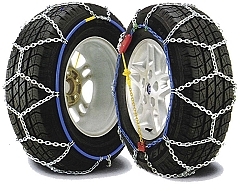 Diamond Back passenger car tire chains. Bought the Diamond back chains from canadianchains.com to fit my 2000 VW Jetta. Shipping was free and the chains arrived very quickly. The chains appear to be well made. Have only had the occasion to use them once so far, but they went on easily and performed well with great traction and no rubbing. 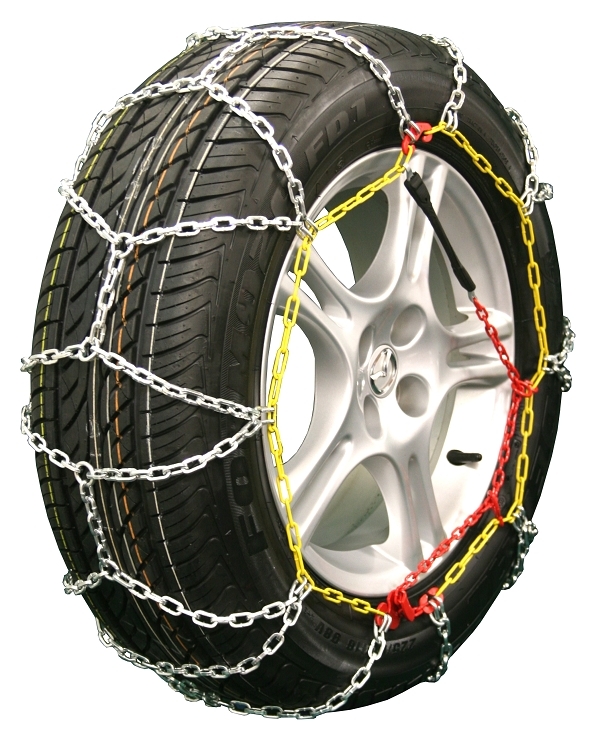 I would definitely recommend both the Diamond Back chains and canadianchains.com to anyone in Canada looking to buy tire chains. Easy to install. Great shipping, arrived in two days from ordering. Not enough snow this year so far to try out but look like they should work well. Dodge Dakota Quad Cab-2WD P235/75/15 Last Christmas, the entire family (family of 4, 3 and 5 year old) had a terrifying experience on a private Muskoka cottage road. The truck lost complete traction going up a hill where we became a 4000lb toboggan headed for a raven backwards, no matter what we did to control the truck. We all screamed as we all thought we were all going to die. Someone did die in the same location the summer before. Quite honestly, we dreaded the trip all year and thought it was silly to invest in a brand new 4wd. This past march break we went to the same area and ended up in the same road conditions on the private road. However, we had these chains this time, and wow..what a relief! We had 100% traction with no issues, as the 4wd's (with snow tires) at other cottages could not make it up the road of hard packed ice. The best part, they are so easy to take on and off, only taking 5-7 mins total, tops. The family actually does time trials for fun when I need to put them on. Canadianchains.ca sent the chains quickly, and our only complaint was the quality of the storage bag they came with. But the high quality of the chains themselves offset any dissatisfaction. We now recommend to all of our friends that access a cottage in the winter on these privately maintained cottage access roads, even if they have a 4wd. The tire chains help me get through unpaved areas that are loaded with snow. Some links have broken but that's probably because of the two times I got stuck in a rut and then tried to put the tire chains on. It's a lot harder to put them on once you get stuck and the wheels are spinning but if you're patient enough you can get those chains on and get unstuck without having to call a tow truck. Well worth the money. They saved me from wasting my three free tows that are part of my auto membership. Not to mention with a record snow fall I've seen so many cars in the ditch that I bet every tow truck in the country would have been too busy to haul me out anyway! I phoned my order in on a Monday morning and before noon on Tuesday they arrived… Less than 24 hours! Wow what great service. I also had several questions that I emailed to Canadian Chains and immediately received replies. I bought the chains for a trip to Whistler… But luckily I didn't have to use them. I did mount the chains on my car before the trip and they appear to be very good quality and are very easy to mount without moving the car or using a jack. Excellent value… Excellent service! Ordered the Diamond Back Chains for my Chrysler 300C with Passenger Tire Size 225/60-18 on line from CanadianChains.ca. Slick to order, quick delivery (2 days), easy install, good fit and great traction. Happy to recommend Canadian Chains in all respects. I purchased a set of Diamond Back chains for emergency use to supplement my snow tires on a steep hill near my cottage. Fit and performance is great. Good customer service too in response to a sizing problem on the initial order. I had the occasion to use my chains on my Dodge Caravan today at the cottage. Without the chains I would still be at the cottage. I have a steep hill from the lake to the road and it was snow covered with an icy base. The truck when up like a charm. I am so happy with the chains. I was the first time that I installed them on the tires. It took me a several minutes to figure it out but they did the work. A very good investment for me. Perfectly fit, I use it and it's like I hope. Canadian Chains provided great service and my order was delivered very quickly. I did a test fit and the chains were as easy to install as in the video. The printed instructions are fine but the video really makes it clear just how easy they are to put on. Now I'm ready for snow!